Real life: This is what I eat for breakfast most mornings. How millennial of me, right? The reality is that it is super quick, ridiculously satisfying and packed with everything I need, right in the morning. Avocados are high in that “healthy fat” you keep hearing about and full of vitamins. 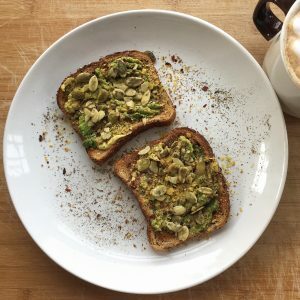 When you aren’t eating eggs and traditional breakfast foods, avocado toast becomes a quick staple. That being said, avocados and fresh bread can be a little pricy. I combat this by using less avocado than traditionally used on the toast and supplementing my fresh bread addiction with cheaper options. There is nothing better than getting a fresh loaf of bread from a local bakery, but it isn’t always an option with a limited budget. So, on weeks when I just can’t fit a $6 loaf of bread into our budget I opt for a store-bought option. One tip when grocery shopping is to look at the ingredients on packaged food. The list should be short and have names you recognize. With bread specifically, you want to make sure the loaf is actually vegan. Not all breads are created equal or 100% plant-based – make sure to read the labels and know what’s in your food. Avocado toast can be adorned with all sorts of combinations but this is my staple. You all know how to make toast I know that. I just wanted to share a peak into my morning routine. Pair this with a homemade, almond milk latte and you’re golden! Once the bread is toasted, spoon the avocado onto each bread slice and smash with a fork. Sprinkle on nutritional yeast, ground flax, and pumpkin seeds to your liking. Season with salt, pepper, and red pepper. Squeeze fresh lemon or lime juice over everything and enjoy!